The Best Western Aquamarin Luebeck has 113 tastefully furnished rooms, some equipped with a kitchenette for long stay guests, offer you a comfortable home. All rooms offer fax and modem connection. Our conference rooms for up to 100 guests offer the ideal setting for family celebrations or seminars. Restaurant Meeresbrise invites you to have a relaxed breakfast, lunch or dinner. You can also enjoy the evening in our cozy bar. 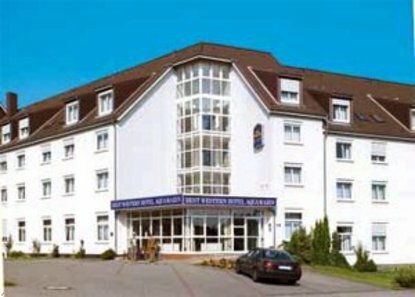 The Best Western Hotel Aquamarin Luebeck is ideally located in Luebeck-St. Lorenz, only 1.5 kilometers from Highway A1 and the historic city center, and an ideal place from where to start your excursion to the UNESCO World Heritage Site. Luebeck is well known as 'The Queen of Hanse' and offers many sights such as the Marien Church, Getting Gate and the City Hall which are the impressing witnesses of Luebeck's history. The Baltic Sea and the Bay of Luebeck are located close to the city and offer a fantastic setting for sailing and other water sports.